Apple has sent out media invites for its annual fall event, being held this year on September 12 at the Steve Jobs Theater on the Apple Park Campus in Cupertino, California. 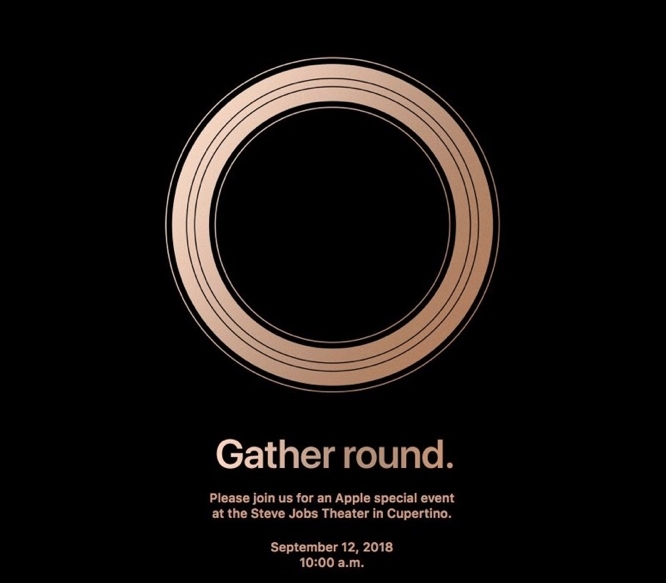 The media invites carry a theme and tagline, which this year likely refers to the new Apple Park Campus, with the phrase “Gather Round”. The event will almost certainly feature the unveiling of new iPhone models, with a trio of new iPhones expected this year if recent rumours are to be believed: a 5.8-inch OLED direct successor to last year’s iPhone X, a larger-screened 6.5-inch OLED version filling in the missing “Plus” model gap, and a lower-cost 6.1-inch iPhone with an LCD display that would in effect be a successor to the iPhone 8 and iPhone 8 Plus, although the entire 2018 lineup is expected to feature Face ID and eliminate the home button entirely. The event is also expected to feature the Apple Watch Series 4 that rumors suggest will include a larger display. New AirPods and Apple’s long-awaited AirPower charging mat will also likely be revealed at the event.